Best for two part fractures involving the surgical neck , isolated greater tuberosity fractures and 3-part fractures with isolated GT involvement. Generally used in physiologically young patients with good bone density. Generally placed in slight beach chair position. All bony prominences well padded. Ensure A/P and axillary views can be obtained. C-arm usually positioned at the head of the table. Fracture is reduced. Usually with longitudinal traction, abduction, posterior displacement and slight external rotation of the shaft fragment. Small incisions made for Schanz pin placement and to place freer-elevator to aid in reduction as needed. A small Schanz pin can be placed into the greater tuberosity to aid in reduction. 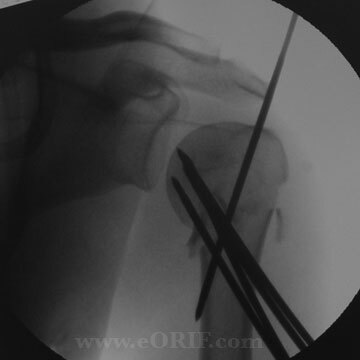 4 2.5mm terminally threaded pins are placed from the shaft into the humeral head. Try to provided as much dispersion in the head as possilbe. Pins shoulde be placed above the deltoid insertion to avoid radial nerve injury. Generally 2 pins from lateral cortex, 1 from anterior cortex +/- GT pins. Pins are then cut off beneath the skin. Pin migration: use 2.5mm pins to decrease risk of migration and follow patients with weekly xrays until pins are removed. F/U with xrays every 10 days to monitor pin migration. Begin pendulum ROM at first visit. Pins removed at 4-6 wks then start PT for ROM. 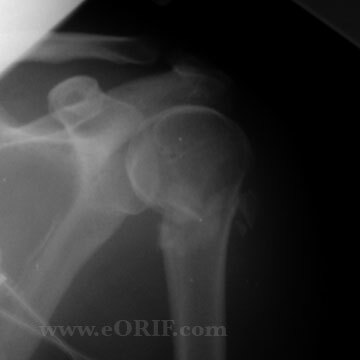 3-part fracture = good/very good functional results; average Constant score of 91% (84% to 100%),no AVN. Results not as good for 4-part fxs with 11% AVN, and risk of further operation. (Resch H, JBJS 1997;79Br:295).